The article caused quite a stir and The Wartburg Watch wrote a blog article in response, which garnered over 200 comments. (The Wartburg Watch routinely gets 300-500 comments on an article now, but three years ago 200+ comments were significant.) The Wartburg Watch article can be read here. 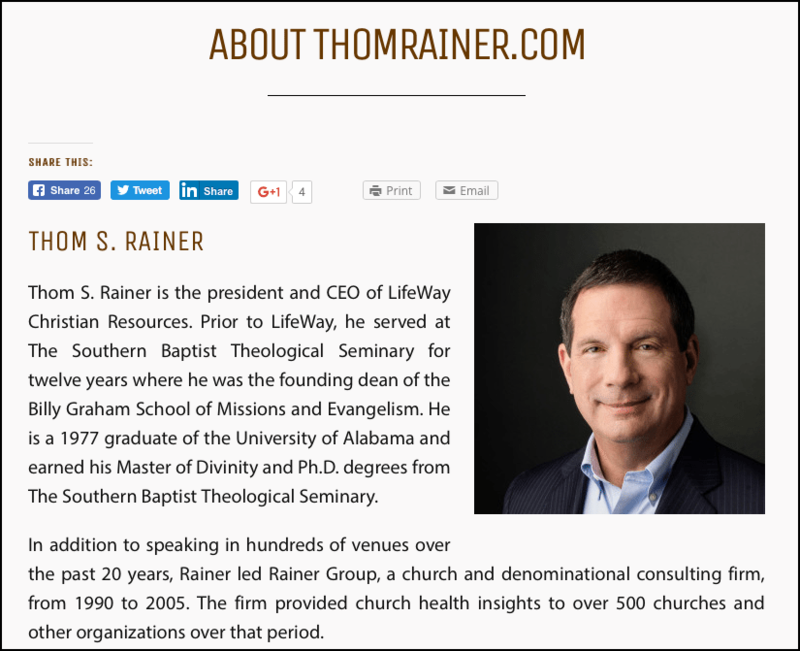 Fast forward three years and Thom Rainer has followed Ed Stetzer’s lead with a similar article, but with a different slant. Stetzer wrote as a pastor, telling his congregation that he would not be doing funerals or visiting church members. 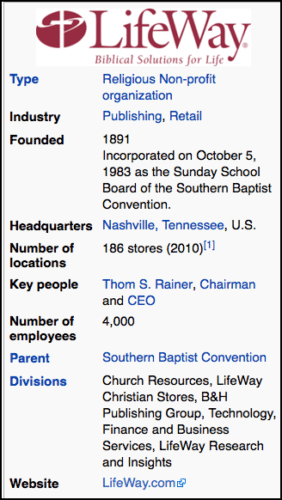 (Although Stetzer is also employed by LifeWay.) Stetzer’s blunt comments may be understandable in that he was a bi-vocational pastor. Several individuals commented on The Wartburg Watch, including Wendy Alsup, a theologian I hold in high regard, that Stetzer is an honorable man and would never leave a church member in need uncared for. It appears that Rainer writes from the pastor’s perspective to a largely conservative, evangelical audience. He is able to say what many pastors would probably like to say but are unable to do so. He, therefore, seems to have many pastors also reading his blog. Rainer earns my praise for regularly writing a blog and then taking the time to interact with those who submit comments. This is rare among men of his stature. He doesn’t exhibit much patience with those who disagree with him, but then few do. But I am getting ahead of myself. 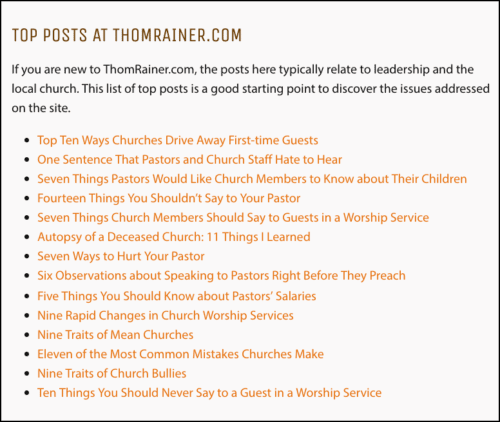 Go ahead and read through the fifteen reasons Dr. Thom Rainer lists in his blog article below which he believes support his view that pastors “should not visit much” and then I will comment on a few more below. Here, briefly are my comments on Dr. Rainer’s points. A pastor engaging in visitation does not deprive members of their roles and opportunities for ministry. Many times pastors visit members while accompanied by other members and many times members will visit others in addition to the pastoral visit. While I would not deny some members may use the “country club mentality” to avoid engaging in works of charity, this is generally not the mindset of an individual who has experienced the love, grace and mercy of Jesus Christ. I consider visitation to be part of a pastor’s job. I also consider preaching to be part of a pastor’s job. When a pastor engages in these activities it doesn’t make me ask what the pastor is doing for me. On the other hand, if he is not fulfilling the duties he is being paid for I would want to know why not. It’s not an either/or scenario. I have seen studies on sermon preparation time and as I recall the average was about 15-20 hours per week. I have documented cases where C.J. 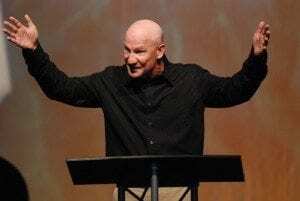 Mahaney runs out the same sermon numerous times. 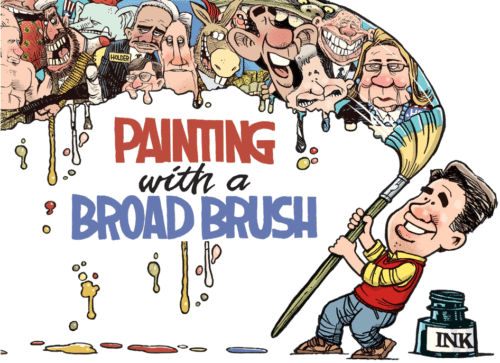 The same with Wayne Grudem, the same with Mack Stiles, and I suspect many other’s do the same. First priority of the pastor should be the people of his church. Now Dr. Rainer is saying that if he engages in visitation he will not be able to engage in evangelism. But if the pastor engages in evangelism is he not guilty of point #2 – depriving his members of opportunities for ministry? I think that the Holy Spirit is sovereign in evangelism and will bring people into the lives of both the pastor and individual members. This point is bogus. A pastor leads by example. If I see him ministering to people, loving people by taking time to visit them, it speaks to me much louder than words on Sunday morning. This reminds me Luke 18:15-17. Does this ever happen? I suppose there is such displays of immaturity by a small amount of church members, but these people will find fault with whatever happens. This doesn’t make sense. A pastor with a lick of common sense would realize he only has “X” amount of hours in a week. Take a basic time managment course and schedule in items such as sermon prep, visitation, meetings, and whatever other duties are involved in the life of a pastor. If we look to please God instead of man this may involve saying no to some things. Make realistic plans for your time. Never having been a pastor, I have no idea what the job entails, but surely some time can be found to visit people. Church size and staff size obviously must factor into this. I realize a lone pastor of a church of 200 may be more pressed than a Sovereign Grace church plant in Louisville with a staff of five pastors for 100 members. I believe many church members are just as pressed for time as pastors, many even more so. I recall while attending a Sovereign Grace church in Gilbert, Arizona, I was working six day weeks, rotating shifts as an air traffic controller. I attended church on Sunday mornings. I arrived early to help with parking lot duties, church set-up or greeting. I helped with Alpha courses. I attended care group. (One of the assistant pastors actually chewed me out for missing care group meetings and suggested if I wasn’t going to attend regularly I should find a new church. Soon thereafter I took his advice, but he was completely unreceptive to my suggestion of having different times and days for care groups to meet.) I was also frequently helping friends in the care group move. Oh, and then we were frequently reminded from the pulpit of the importance of having a “date night” with our wife! I would like to see some studies backing up the claim that visitation leads to pastor burnout. I agree short-term pastorates are not healthy for churches but the reasons I have personally witnessed pastors leaving for are better pay at larger churches, scandals, and causing much dissension and rapid loss of large numbers of members by attempting to drive a church into Calvinism and 9Marx beliefs. The pastor succeeded in driving away 70% of the members and then, amazingly, felt called to another church! Again, I see this as a faulty argument. A pastor is expected to participate in visitation, but this doesn’t mean he is the only one who visits members. Similarly, a pastor is expected to participate in evangelism, but so are all Christians. I would like to see some factual studies to back up the claim that many of the best church members are leaving because the pastor is visiting church members. In a Pew Research study I recently viewed of why people have left church it stated that “One-in-five express an opposition to organized religion in general. This share includes some who do not like the hierarchical nature of religious groups, several people who think religion is too much like a business and others who mention clergy sexual abuse scandals as reasons for their stance.” Surprisingly, nobody mentioned that they quit church because, golly gee, that pastor just visited the church members too much! Again, I would like to see some factual evidence that back up this claim. A sign of a dying church is if a member asks “why didn’t a pastor visit me?” Are you serious? Maybe the reason the church is dying is because the pastor never visits anyone. I know an elderly man in Nampa, Idaho, who has attended a fairly large Nazarene church for 20 years. This man is suffering from cancer and the beginning stages of Alzheimer’s disease. He has received no visits from any of the pastors. One saintly family routinely invite him to their home for dinner. Jehovah’s Witness members are routinely visiting him and leaving their literature. Perhaps the Nazarene pastors subscribe to Dr. Rainer’s views. All I can say is when I attend my father’s funeral I will be one of those people aksing the pastor why he never paid my father a visit. “The Christian minister out of the pulpit should be a sociable man. He is not sent into the world to be a hermit, or a monk of La Trappe. It is not his vocation to stand on a pillar all day, above his fellow-men, like that hare-brained Simon Stylites of olden time… Salt is of no use in the box; it must be rubbed into the meat; and our personal influence must penetrate and season society. Keep aloof from others, and how can you benefit them? Our Master went to a wedding, and ate bread with publicans and sinners, and yet was far more pure than those sanctimonious Pharisees, whose glory was that they were separate from their fellow-men. Some ministers need to be told that they are of the same species of their hearers. It is a remarkable fact, but we may as well state it, that bishops, canons, archdeacons, prebendaries, rural deans, rectors, vicars and even archbishops, are only men after all; and God has not railed off a holy corner of the earth to serve as a chancel for them, to abide therein by themselves. C. H. Spurgeon, “Letters to my Students,” Book I, pages 182-83. Let me now present an opposing view to that of Dr. Rainer’s. I trust you will see the wisdom of Baxter’s view of visitation. Baxter lamented a situation in his day that is similar to our own. Many, he said, treat the ministry as “but a trade to live by.” However, there is a key difference between pastoral ministry and every other occupation. Pastors are called to be shepherds of the church of God (Acts 20:28). They are not called to “do a job” or even to carry out “professional responsibilities,” but are summoned into a living, personal relationship with a community of people on behalf of Jesus Christ. Pastoral ministry is, in essence, a personal relationship. We cannot put sharp boundaries around authentic personal relationships, because they are grounded in the communion of whole personalities that cannot be fragmented into “roles” or “functions.” In a marriage it is impossible to separate the “roles” of friend, lover, partner, adviser, critic, or cheerleader that are bundled together into the designation “spouse.” Likewise, pastoral ministry defies the categories and classifications of the modern “job description” that tends to reflect the alien ethos of business or government more than the values of the kingdom of Christ. The “job” of the pastor is determined by our calling to care for people in the name of the Good Shepherd. Baxter understood that ministers cannot think about what they do apart from who they are and whose they are. Baxter’s holistic understanding of ministry with reference to the last part of The Reformed Pastor is illustrated when he deals with “personal catechizing and instructing,” or pastoral visitation. Visiting, Baxter argued, is the principle method of bringing about personal “reformation” in the parish. (This is the sense in which he talks about the “reformed” pastor. “Reformed” does not refer narrowly to a particular confession but should be under stood in the sense of “re-formed” remade, reshaped, renewed.) Baxter combined visitation with instruction into an overall strategy of pastoral care. He insisted that every pastor should devote a large portion of the week to visiting people in their homes, following the apostles’ example (Acts 5:42) by instructing them on the “principles of religion” and testing their knowledge. Even in the seventeenth century, it seems, pastors resisted going out and visiting their flocks. “We teach our people in public [on Sundays],” they argued, “how then are we bound to teach them [individually] besides?” Baxter tried to get pastors to stop thinking of visitation as an onerous duty and to consider it an advantage to both themselves and their people. The people benefit when the pastor combines visiting with personal instruction, because one-on-one encounters lead to deeper intimacy and effectiveness. Baxter describes the sort of person with whom every pastor is familiar: the faithful pew-sitter who, after listening to decades of sermons, still does not know the difference between Genesis and Revelation, let alone the more subtle points of Christian doctrine. More can be accomplished with such a person, he argues, in 30 minutes of private conversation than in 10 years of preaching, because the communication of the gospel is a profoundly personal event. The pastor mediates a personal Savior to his or her flock, person-to-person. Each person tends to respond to sermons in his or her own way, and often they do not hear accurately what the preacher has said. Personal conversation can deal with the individual’s own peculiar needs and correct misunderstandings. Regular personal instruction benefits the pastor as well as the congregation. People get to know a pastor who visits and can cooperate more effectively in the redemptive work of the church. Knowledge of Scripture combined with intentional visitation are the practical foundations of evangelical preaching: “as the physician’s work is half done when he understands the disease, so, when you are well acquainted with your people’s case, you will know what to preach on” (page 228). Indeed, Baxter regarded personal instruction as a form of preaching. “Surely,” he wrote, “a man may as truly preach to one, as to a thousand” (page 228). Visitation also engages the pastor as a healer. Baxter uses the images of the “shepherd” and the “physician” to describe the minister. We are called to bind up the brokenhearted and to heal their wounds with the medicine of the gospel. Unlike other helpers, pastors can actually go out to seek and save the lost. We have what Paul Pruyser has called “the pastoral right of initiative and access.” Once people have invited us in, we discover how many broken and breaking hearts there are out there. It never ceases to amaze me how people will open their hearts to their pastor during the course of the visit, confiding things they have not told even their closest friends or family. We can use such opportunities to teach them of the healing power of the Savior. Conditions are very different today from what they were in the 1600s. Consequently, it is not easy for pastors to do what Richard Baxter did: spend all day Monday and Tuesday interviewing families. Practically speaking, people are too scattered today, both in terms of geography and of lifestyle. However, Baxter’s central principle that personal visitation strengthens the total pastoral ministry can still be adapted profitably to the contemporary situation. This is especially true in smaller communities where the neighborhood church still exists. No matter what the difficulties, it is essential that we pay attention to Baxter’s model of the active pastor “going out,” “seeking,” rather than passively waiting for people to come to church, to join Bible study, to make appointments. There are many occasions when visiting and teaching can be combined. First, the pastor has certain “rites of passage” which provide excellent teaching opportunities. Visiting with a young couple planning to get married, with parents after the birth of a child, with bereaved families these are all opportunities for deepening Christian understanding. Marriage appointments can be a time to instruct couples about the uniqueness of the Christian concept of love in contrast to popular romantic notions. The pastor can relate the unconditional love promised in the marriage vows to the unconditional love of Christ for His people, and actually invite couples to a deeper Christian commitment. Baptisms or dedications can be opportunities to teach about God’s covenant faithfulness and His promise of a future. Pastors can bring young parents into touch with Jesus’ words about childlike faith. Funeral preparations not only serve a comforting purpose, but are moments for teaching about the gospel of resurrection. Second, pastors can teach during times of crisis. The death of a loved one, the breakdown of a marriage, or the loss of a job plunge people into emotional, social and spiritual crises. Particularly in smaller communities, with limited mental health resources, the pastor is still most likely to receive the first cry for help when lives begin to crumble.” Pastors continue to be on the very front lines in dealing with individuals and families in crisis. Acute loss is often accompanied by feelings of guilt. “What did I do to cause this to happen? What could I have done to prevent it from happening?” People are brought face-to-face with issues of sin, failure, and injustice at such times. Visitation at times of crisis affords the pastor the opportunity to bring people into touch with the realities of grace, forgiveness, and hope that lie at the heart of the gospel. Visits during passages and crises are special opportunities for pastoral instruction. It is not necessary to wait for these exceptional moments. Regular visitation in people’s homes should have an implicit teaching or proclaiming component. It is not always possible or desirable to have an overtly theological discussion. In most cases, it is possible to apply Christian faith and teaching in some way to the concrete circumstances of life. 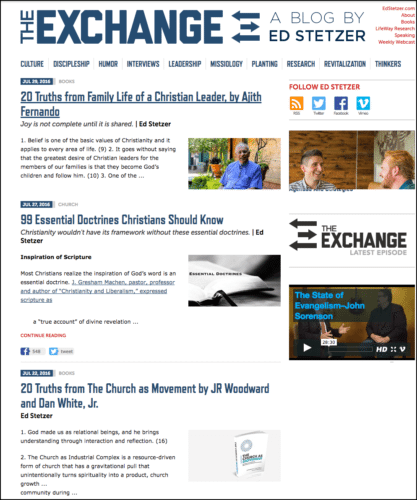 There are many excellent resources that can guide and encourage the present-day pastor. I have found none more challenging and rewarding than Richard Baxter’s The Reformed Pastor. As for the numbered posts- it’s clickbait. They are really overdoing it! As for the man in that photo, his eyes are incredibly cold. Thanks for the observations. Don’t be shy to comment again! This stuff is indeed concerning. Pastor – and any ministry type position in general – now includes “author” – writing and saying the basic things everyone Christian is thinking or can think and then pretending it’s profound. It’s all a snooze fest. It is also common to monetize your experiences and works and publicize them to the masses, as if millions upon millions of people aren’t already doing the same things. Now, if you have a thought, God surely has called me to be a writer and speak to the masses! What happened to self-awareness and doing and serving in the quiet? The Holy Spirit’s anointing and humility and fruits of the Spirit are missing. And no, decent public speaking skills and putting theology words together does not equal anointing. I cannot imagine a pastor not desiring to visit with his people, sick or healthy (hanging oUT withe your people is essential!) Of course you need deacons or church members and other pastors to help if you have a larger church, but that reality shouldn’t dismiss the general desire to visit and be with whom you can. The potential for people to take advantage or view the pastor as more spiritual or holy and “needing only him” when suffering or ill is not an excuse to neglect this essential task. After all, jetting across the country speaking at conferences and writing books and “pastoring” thousands of faceless people you will never meet and sending the message you are spiritually superior to the masses seems just fine. Thanks for the comment Holly. I agree with your sentiments. Paid Professional Pastors, in Pulpits, Preaching to People, in Pews??? Can anyone find this, today’s pastors, anywhere in the Bible? To give 10% of their income to them. Ooops, I mean To God. Oy Vey!!! To a church? A pastor? To pay a salary? Can some SBTS, edjumacated theologians, help me out here? 1 – One of **His Disciples** who called them self, pastor? 2 – One of **His Disciples** who called another Disciple, pastor? 3 – One of **His Disciples** who took the “Title/Postion,” pastor? 4 – One of **His Disciples** who was “Hired or Fired,” as a pastor? 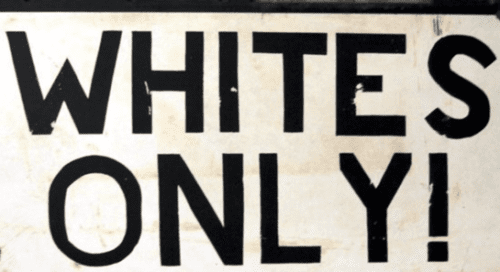 5 – One congregation “led” by a pastor? Thanks for the comment David. I went to the link you supplied and read the bullet points – this is almost in direct contradiction to his 15 point article I just covered! Even in this article it appears Rainer moderates his position within the comments section. He interacts with many of the comments and seems to not be against visitation, but it needs to be balanced with other duties. I doubt anyone would disagree with that, but then are there really pastors out there who spend all their waking hours engaged in visitation ministry? And how does this viewpoint co-exist with Rainer’s first point – that visitation is unbiblical? Always good to hear from you A. Amos! I trust you are well. The whole thing is corrupt, the whole notion of a primary pastor as leader and nigh exclusive speaker and teacher and CEO of a Christian fellowship. Such a role does not exist in the New Testament, where the rule is mutual submission, all parts of the Body being of equal importance and crucial function, leaders leading by example alone and never by compulsion, leading itself being coming under and helping rather than coming over and dictating. So it should come as no surprise that those who think themselves fit to assume this pompous CEO role with the spotlight on them (rather than Jesus) and all eyes focused on them weekly (rather than Jesus) would tend to be people like Thomas Rainer, full of self and horrific advice. He’s advocating for a role that doesn’t exist, that is in fact deleterious to the function of the Body of Christ. No wonder he is clueless, confused, corrupt in his thinking. I don’t want someone calling themselves my pastor–who’s regularly wheedling for my hard-earned money so they can feed their salaries and benefits packages and fund their book deals and building expansion programs and grow their influence and build their brand–to come by my house for a home visitation anyway, I’d rather have a good friend in Christ come by, someone who has actual empathy for me and has proven themselves reliable and trustworthy, rather than someone who probably sees me primarily as a giving unit and only comes by to do his duty and puts on a faux sorry face and vaguely feigns empathy. 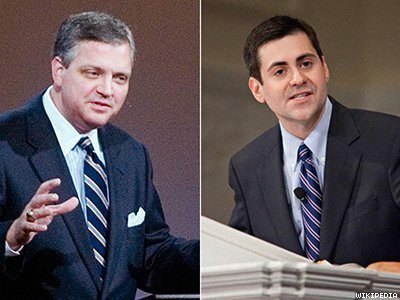 In a time of need, the last thing I want is a person who goes to a place like SBTS where he learned quite well to think himself superior to the mere rabble to come by and condescend. Thom comes by my place, he’ll get a good talking to and the door slammed in his face, just as Paul would treat any superapostle. Fantastic comment! Thanks for sharing. I hope to write another post on an area you touched on – Rainer’s plea for church members to purchase assorted gifts for their pastor. But I wonder how much visitation those guys are doing, even with a pastor-to-congregrant ratio of 20:1. I have my doubts! I also have my doubts Edward. Unless you smell of cash they probably are too busy! I have read comments on SGM Survivors where Mahaney was said to avoid talking with the lowly pew sitters. I also read somewhere that Driscoll had a passageway constructed from his office directly to the “stage” so as to avoid contact with the rabble! I think they may be writing their titles that way because in internet searches numbers are placed above letters. 9 Marks is placed before ABC Church. Thanks Velour. I was not aware of this, but it makes perfect sense. These guys are market savvy! Hey Buddy!, I found this information for you: "1 Item Dr. Rainer and I Disagree On". Here is the website link: https://thouarttheman.org/2016/09/08/4627/. Thank you.